Nike in Freudian slip about Sneijder? This is definitely a piece of image to send the transfer muppets straight into orbit, so strap in. 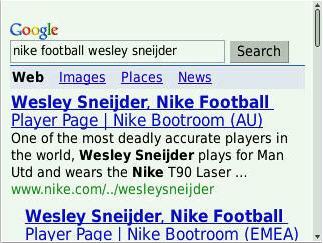 If you type ‘Nike Football Wesley Sneijder’ into google then you might find a strange little result. In what can be a possible mix-up, it seems like Nike have Wesley Sneijder down as a Manchester United player on their official website. This could be either a complete mistake, the more likely reason, or it could be a bit of an early update? Considering reports were rife today that David Gill was in Milan furthering talks about Wesley Sneijder, maybe we are trying harder to sign the diminutive play-maker. Nothing like a good old transfer saga eh?